Protesters across Canada have come out in support of people from a northern B.C. First Nation who have been preventing a natural gas pipeline company from accessing their traditional territory. 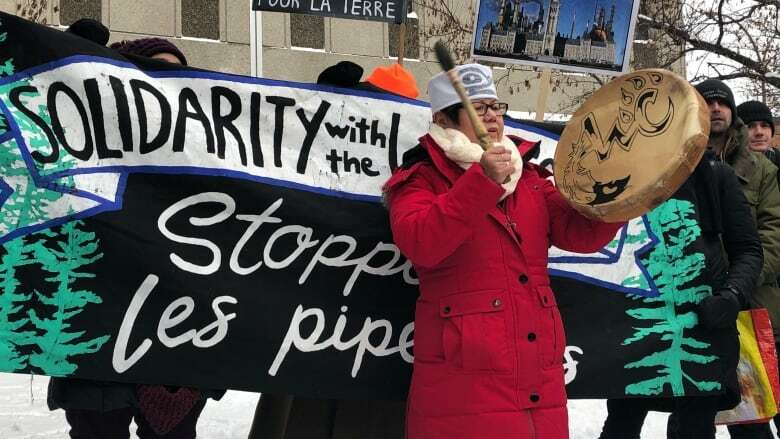 In Ottawa, around 100 people gathered on Parliament Hill, protesting the RCMP's intervention, on Monday, at a fortified checkpoint on a forest service road near Houston, B.C. Fourteen people were arrested at the site, where some members of the Gidimt'en clan of the Wet'suwet'en Nation had set up a camp to control access to their territory. 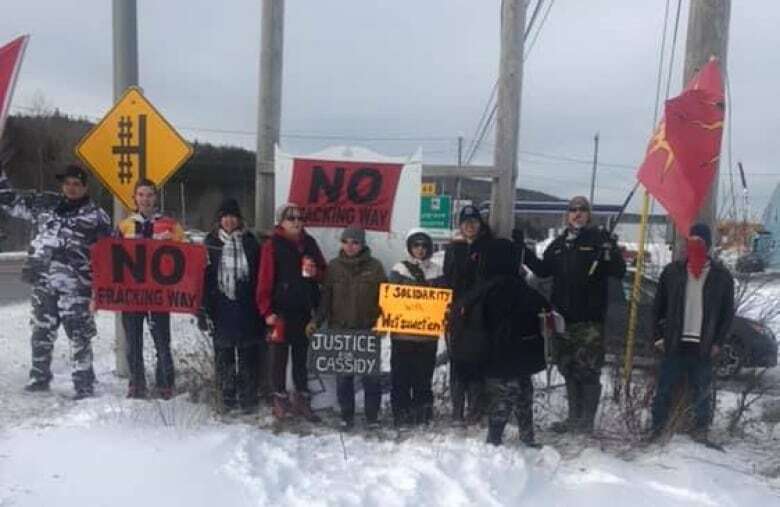 RCMP were enforcing a court injunction, granted in December, ordering people to stop preventing Coastal GasLink from gaining access to the road and a bridge. Coastal GasLink is a pipeline project operated by TransCanada, which manages pipeline networks, natural gas storage sites and power generation facilities in Canada, the U.S and Mexico. Some protesters on Parliament Hill held signs saying "Oh Canada, respect Native rights" and "The RCMP, proudly suppressing Indigenous rights since the 1880s." They also chanted, "This is wrong, this is wrong." The marchers briefly shut down the street in front on Parliament Hill, drumming and singing before marching down one lane. 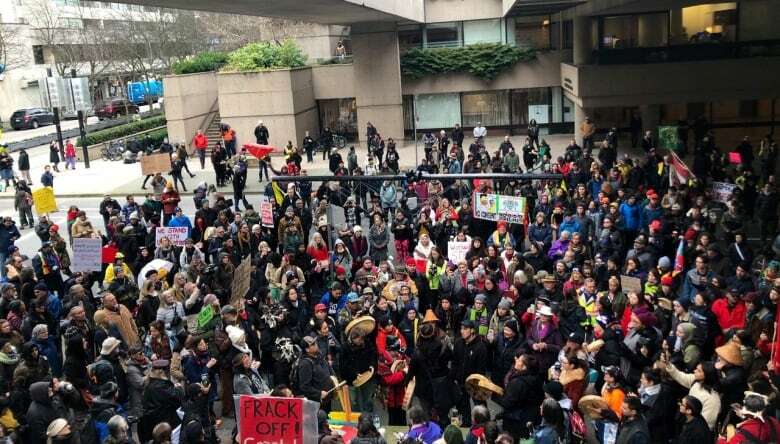 In Vancouver, hundreds of people gathered outside the B.C. Supreme Court building and Smithe Street was shut down as the crowd began marching down the route to Victory Square. Many people said they were there to show support for people who were trying to protect their traditional territory. Some protesters said they are upset with the government's support for the pipeline project. They want to see more investment in green energy projects. Others said they were outraged by the RCMP response to the protest camp. In Montreal, people gathered outside Prime Minister Justin Trudeau's Papineau constituency office. "This is where I really need to be, with the people who stand behind our nation, our people," said protester Marlene Hale. "We're out in the cold doing what we should be doing, which is really beautiful to see." Hale is from B.C. 's Witset First Nation. She said Monday was an emotional day because she briefly lost contact with her family, who live in the area, and saw photos over social media and news of the arrests at the camp. "It was sad to see, especially when I see it's my elders, my chief, my family and my cousins. I don't feel helpless. I'm doing what I can, how I can to pass the message on. That's the most important [thing]." Around 100 people rallied in Montreal. "It's important to show solidarity even though we're far away in Montreal. Canada is a big country, even what happens in B.C. is important in Quebec," said student Magalie Desmarais-Michaud. Desmarais-Michaud spends her springs tree planting in that area of B.C. "It's a territory that I know well and am familiar with. It's a really beautiful place and I'd hate to see anything happen to it from environmental impacts from this pipeline," she said. Rallies in support of the Wet'suwet'en clans were also held in the Atlantic region. In Nova Scotia, about 20 people with signs and flags staged a protest midday on the Trans-Canada Highway and slowed traffic between mainland Nova Scotia and Cape Breton Island. Organizer Madonna Bernard said the group made a point to inform the local RCMP detachment of their plans. 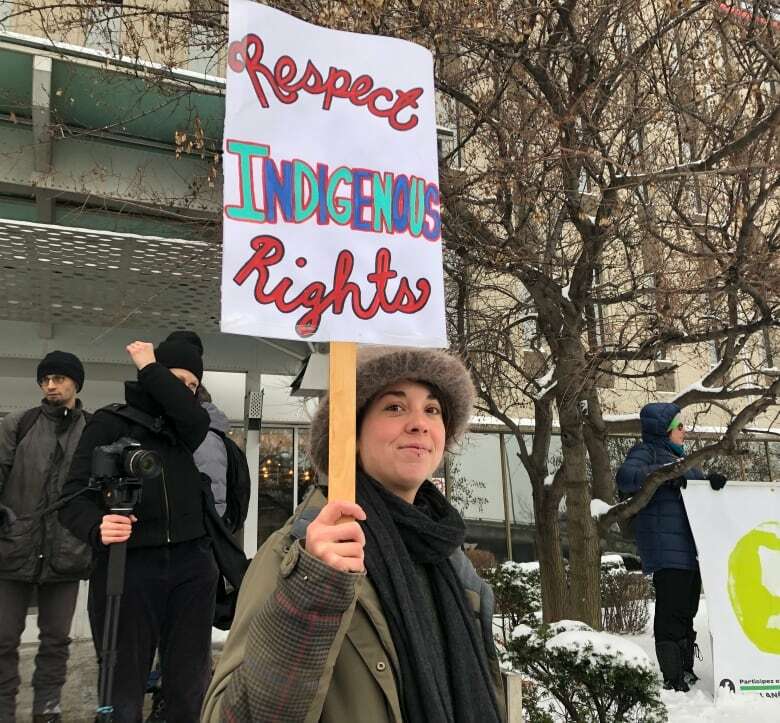 Bernard, of Nova Scotia's We'koqma'q First Nation, said she believes RCMP officials should respect Indigenous laws and international treaty rights and stand down in B.C. "When they swear an oath to the Crown … they're obligated to [respect] us as sovereign nations," she said. In New Brunswick, around 25 protesters reportedly gathered outside and inside the RCMP detachment in Richibucto, N.B., Tuesday morning, bearing signs asking the Mounties not to interfere with the protest in B.C. In Toronto, hundreds of people came together in Nathan Phillips Square before taking to the streets through the financial district. "I'm trying to communicate urgency and that it's time to wake up, it's time to get involved," said Eve Saint, one of the organizers of the Toronto rally. Saint grew up in Toronto, although her father is Wet'suwet'en. She spent some time in the territory last summer and also over the winter solstice. "It's just different when you go to the territory and be on the land," she said. "That was the first time I was ever able to drink from the river and it tasted so sweet." Members of the Wet'suwet'en Nation had established two camps along the forest service road with fortified checkpoints: Gidimt'en and Unist'ot'en. They had been preventing Coastal GasLink workers from getting through their checkpoints, asserting they can only pass if they have consent from hereditary leaders. The Coastal GasLink pipeline is meant to transport natural gas from northeastern B.C. to the coast, where a liquefied natural gas project is scheduled for construction. TransCanada has said it signed agreements with all First Nations along the proposed pipeline route to the $40 billion LNG Canada facility being built in Kitimat, B.C., but some hereditary chiefs say those agreements don't apply to the traditional territories. 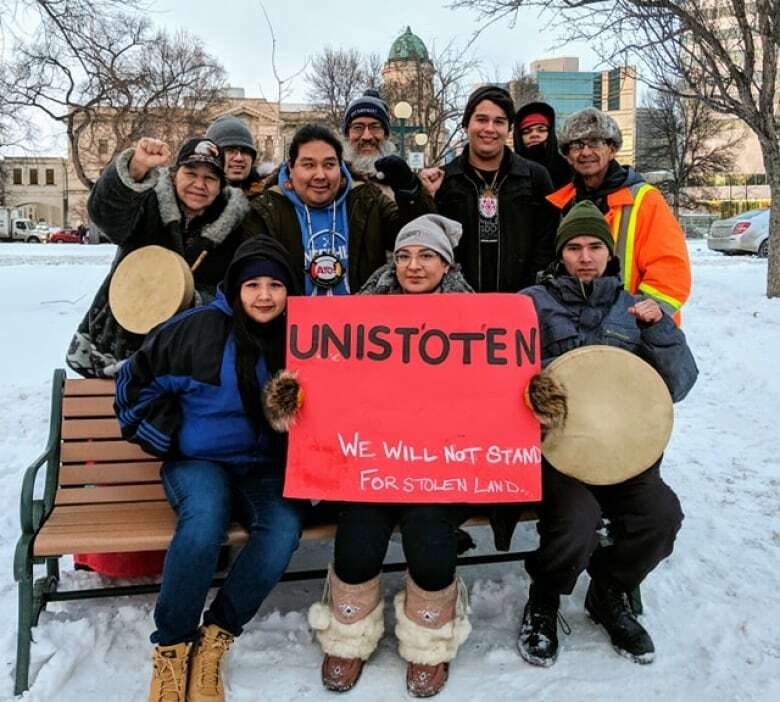 An RCMP statement says the arrests on Monday came when officers determined a resolution was unlikely after they spoke with camp members about complying with a court order and removing the checkpoint.